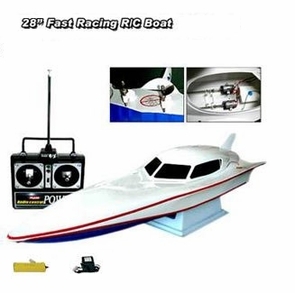 This remote control (RC) speed boat is fast! Highly realistic features make this boat great for beginners to experts. Comes with high performance motors for super fast speeds of about 15-20 mph and great maneuvering capabilities for under 100 bucks! Check out the video of this RC boat below. Order today and start boating tomorrow. Measures over 2 feet (28") long and has a super long operating range of about 500 feet. Still want more? Act now and we will include a 7.2v rechargeable battery pack and charger! Perfect for all ages. Measuring over 2 feet long and featuring authentic and stylish detailing, this craft is perfect for pools, ponds, rivers, lakes, and even the bay or ocean. Take this fully functional reproduction of an offshore racing boat out to the water and watch it fly! The twin propellers are controlled from the dual joystick transmitter to provide top speeds with forward, left, and right turning functions. When you receive the remote control boats you will see a piece of paper inside the box, taped to the Styrofoam (see picture on this page). Peel back the paper and you will see the antenna for the transmitter is attached to the reverse side of the paper. Remember, these RC boats must be in the water for them to work properly as the water completes the operating circuit. Have fun RC boating and make sure your battery is charged for about 3 hours before using it. received the item in a timely manner, excellent rc boat. HAD A BLAST WITH MY NEW BOAT! When my boat arrived in the mail I was so surprised at how big it was even though I knew the size. Took it out last weekend and everyone was super impressed with the speed and size. We ran it "full out" for probably 15 minutes and then the battery died ... recharging time :) . Would love to order more boats! This little boat will run!! This is our first remote controlled boat and it goes fast! Very nice product. Is as fast as expected and turns great. Battery lasts for a good time too. Bought a second immediately after using the first! this was well worth the money. awesome buy. sweet boat goes pretty fast for a low price. Goes around twenty and I was impressed by the long lasting battery. Ran this boat for four days. You must run the battery all the way down before charging again as recommended. This boat is fast and a great value for the money. The boat is well sealed and does not take water. This boat is a lot of fun.